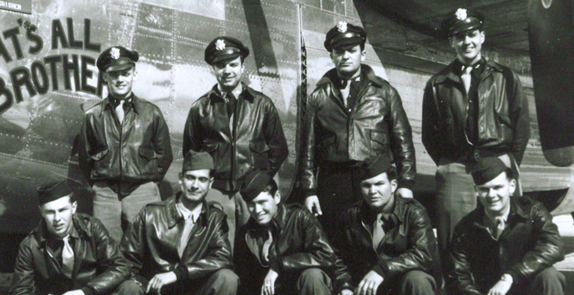 The Wolf Crew was one of the original crews for the 492nd BG that trained in Alamogordo, New Mexico. They transferred in as crew 1676 from the 330th CCTS (Combat Crew Training School) in Biggs, Texas, on 3 Mar 44. They were assigned to the 859th BS, designated as Crew 911. 2nd Lt Daniel Wolf signed out for a B-24J, 44-40120. The ship was given the nickname THAT'S ALL BROTHER. In April 1944, they flew their assigned aircraft to North Pickenham, England, via the southern route. The Power Turret and Gunsight Mechanic, Cpl George Miller flew with them, thus bumping Cpl Capers onto the Queen Elizabeth. Lt Wolf flew as the aircraft commander for Crew 911 for 27 missions. Initially they were only given credit for 25 until many months later. We can't be positive of all of the personnel changes on some of their missions. It's always possible that the bombardier could have missed the pathfinder-led missions. The Crew suffered only one fatal casualty and that was on another ship. On 19 May 44, Lt Zahn filled in for the Brantley Crew 905's navigator, F/O Kingston, who was sick. The Brantley Crew was shot down. Six of the men on board, including Zahn, were killed. MACR 5247. Kingston replaced Zahn on the Wolf Crew. When the Group was disbanded, the Wolf Crew transferred to the 467th BG. There they were assigned to the 788th BS and were redesignated as Crew 11. They finished the war with 31 missions (later 32, as the one early return mission was credited) plus several gas trucking flights. All of the crew returned to the US except for Wolf. He was reassigned to the 61st Troop Carrier Group to serve as an instructor for C-109s, modified B-24s for cargo carrying. He was killed in a mid-air collision during a routine training flight over England.